In the research literature on the global market in looted cultural objects, the objects in question have tended to be referred to as ‘illicit antiquities’. Two examples of this from the current team’s work are the Illicit Antiquities Research Centre, which Neil Brodie directed at Cambridge University between 1998 and 2007, and the book Going, Going, Gone which is subtitled ‘Regulating the market in illicit antiquities’ (Mackenzie 2005). Why do we use ‘illicit’ rather than ‘illegal’ or ‘criminal’? In criminology there is a line of analysis which seeks to focus in on, and expose for closer inspection, the line between criminal and non-criminal behaviour, and the parallel lines between ‘right’ and ‘wrong’ behaviour, or moral and immoral behaviour. Writers in this vein emphasise the point that while the criminal justice system tends to operate a strict binary distinction between criminal and non-criminal (or guilty and not-guilty), in reality some actions can be harmful but not illegal (Passas and Goodwin 2004). This is often because the criminal justice system has not yet caught up with the movement of contemporary sensibilities around harm (Hillyard et al. 2004). Some social actions may therefore be generally condemned, usually due to the perceived harm they cause, while not (perhaps yet) being illegal—they are ‘lawful but awful’ as some commentators have put it (Passas 2005). Many harmful effects of the globalisation of neoliberal capitalism fall into this category (Friedrichs and Friedrichs 2002; Friedrichs 2010). As well as actions which are technically legal, we can also consider actions which are technically illegal but hard or impossible to prove to the appropriate legal standard. Many criminal actions go unpunished because the wrongdoing cannot be proven. In such cases we are often not able to say the action was ‘criminal’ or ‘illegal’, and the successful defendant would certainly point to the absence of a conviction to support their contention that no crime or illegality took place. Both of these types of issue are observable in the case of the global traffic in cultural objects—i.e. (a) sharp or unethical practices which are not illegal but we might reasonably say would be perceived by the majority of lay people as ‘wrong’; and (b) crimes or other contraventions of law which often cannot be proven to the standard required by the relevant legal system. Looted antiquities may be ‘illegal’ due to their excavation in contravention of a local law. Most source countries have ‘state vesting statutes’ through which the state asserts ownership of buried cultural objects, making finders who take them without authorisation essentially guilty of a theft. Another common form of illegality in this form of trafficking is unlawful export from a source country. Where these contraventions of law can be proven to the requisite standard, we would be justified in calling these cultural objects ‘illegal’. For many reasons, however, this proof may not be available. The question of what to call, and indeed what to do with, cultural objects which have no apparent evidence of illegality or proof of its absence in their past is really at the centre of the contemporary debate about the looting problem, and within the cohort of unprovenanced antiquities there will be objects that are more and those that are less suspicious. Some proponents of free trade in cultural objects would hold that without definitive proof of looting, trade in unprovenanced artefacts should simply be viewed as legal. The criminological perspective outlined above, however, encourages us to be more nuanced in our approach, and to develop terms and concepts which can capture the uncertainty which the justice system has obscured with its harsh binary distinction. ‘Illicit’ antiquities is the term which has developed in the research literature to convey the perceived suspect origins of artefacts which cannot be, or have yet to be, proven illegal. Not all unprovenanced or unprovenienced antiquities will fall into this category, but some will. 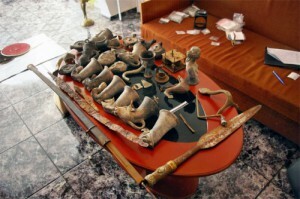 The challenging international nature of this trafficking problem also results in the problematic situation that cultural objects may be looted or otherwise stolen in, or illegally exported from, one country and subsequently legally acquired in another (Prott and O’Keefe 1989). In addition to the situation mentioned above where a dispossessed state as owner simply cannot prove its claim, this can occur through the conjunction of limitation periods with laws on the acquisition of title to moveable property, which in some countries can function to give good title to a good faith purchaser in what is sometimes a surprisingly short period of time. Artefacts thus acquired would not therefore properly be definable as illegal, having been ‘legitimated’ in this respect, but does such legal acquisition delete the illegality which has occurred in the object’s past? For those concerned with recording, understanding and ameliorating the problem of looted cultural objects, the answer is surely not, and we therefore need terminology to use for academic analytical purposes rather than for legal ones. Again, the preferred language here seems to have settled, for the moment at least, on the term ‘illicit’. Friedrichs, D.O. (2010) Trusted Criminals: White Collar Crime in Contemporary Society. Belmont, CA: Wadsworth. Friedrichs, D.O. and Friedrichs, J. (2002) ‘The World Bank and Crimes of Globalization: a Case Study’, Social Justice, 29(1-2): 13-36. Hillyard, P., Pantazis, C., Tombs, S. and Gordon, D. (eds) (2004) Beyond Criminology: Taking Harm Seriously. London: Pluto Press. Mackenzie, S. (2005) Going, Going, Gone: Regulating the Market in Illicit Antiquities. Leicester: Institute of Art and Law. Passas, N. (2005) ‘Lawful But Awful: “Legal Corporate Crimes”‘, The Journal of Socio-economics, 34: 771-86. Passas, N. and Goodwin, N.R. (eds) (2004) It’s Legal but it Ain’t Right: Harmful Social Consequences of Legal Industries. Ann Arbor, MI: University of Michigan Press. Prott, L.V. and O’Keefe, P.J. (1989) Law and the Cultural Heritage, Volume 3: Movement. London: Butterworths.